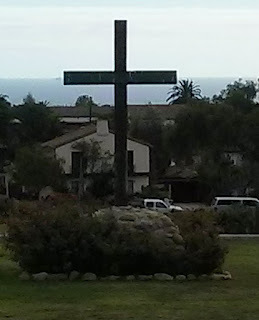 THE SIGN AND THESACRIFICE: The Meaning of the Cross and Resurrection. By Rowan Williams. Louisville: Westminster John Knox Press, 2017. 106 pages. Part One is divided into three chapters, each of which concludes with a set of discussion questions. The first chapter, titled "The Sign," reminds us that in the earliest days of the church, the cross was the symbol of "suffering, humiliation, and disgrace." It was, the sign of "an empire that held life very cheap indeed" (pp. 3-4). Yet, it became the most important symbol of the Christian faith. This required a lot of explaining on their part, and they found in the cross a sign of a word that was changed by what happened on a cross. As for those who would suggest otherwise, that the cross wasn't an early sign, the New Testament suggests otherwise. It became a sign of God's love and freedom, as well as divine forgiveness. The Cross is a sign, but it is also the place of sacrifice, the subject of chapter two. Williams takes note of the discomfort many have with sacrificial language, in large part due to the ways in which sacrifice has been understood. Again, he reminds us that there is no pre-cross Christianity, and the New Testament links the cross to sins. With that in mind, Williams helpfully explores the nature of sacrifice in the Old Testament and New Testament, opening up the variety of ways it is understood. He speaks of three ways in which the New Testament spoke of the death of Christ as sacrifice. First, it speaks in terms of a rescue operation. Secondly, this rescue operation isn't just about the fate of individuals, but of the community. Finally, it is understood in the context of covenant. It seals the relationship between God and community. Noting that the cross is understood as symbol or metaphor, to take up the cross is understood to be a sacrifice of obedience. As Williams writes, "this is a world in which if you try to give your heart to God you may find your blood shed" (p. 31). As such it is a gift of God to God. I’m not sure that his mediation on sacrifice will resolve all questions, but it is important that we recognize the way in which the cross has been understood through time. The language of sacrifice is present in Scripture, especially in the Book of Hebrews, and throughout Christian history. We can’t avoid it. There is at least some guidance here that can encourage conversation. The third chapter explores the idea of the Cross as Victory. Here, Williams turns to the to the Gospel of John, noting Jesus' final words— "It is Finished." Williams suggests that these are words of victory, because "he has conquered, because he has at each moment given himself in unreserved love, dedication and obedience to God and to the needs of the world" (pp. 40-41). In early Christian thought, the cross becomes a throne, from which God reigns. We see this idea present in the Christus Victor vision of the atonement. This has become a more attractive option in recent years, and Williams gives a brief but helpful introduction. It’s good also to see another scholar engage the Gospel of John. As noted before, the Christian faith is rooted in both the Cross and the Resurrection. So, Williams offers us two chapters of reflections on the Resurrection. He titles them "The Resurrection—Then" and "The Resurrection—Now." In the first of these two chapters, Williams invites us to explore what the New Testament says about the Resurrection. As with the Cross, he brings the Resurrection front and center, speaking of it in terms of the inauguration of a new age. He suggests that talk of the end of the world in the New Testament isn’t the same as what we see among many apocalyptic-style modern Christians. Instead, what we have here is a vision of transition from the old age to the new age. In the Resurrection, the New Age begins, and it is the final age. In this new but final age Jesus is alive and active. This has important theological implications, because "you can't simply have a theology about Jesus which is about the Jesus who walked in Galilee and nothing more" (p. 69). I love the way he reminds us that the church is not the "Jesus of Nazareth Society." We don’t gather simply to talk about a dead prophet or social activist. We’re talking about the risen Christ. Taking a very orthodox tack, he suggests that the New Testament vision of the resurrection isn’t simply "internal to the minds of Christian believers" (p. 75). The claim of the New Testament is that Jesus appeared alive to the disciples, and as a result the world was changed. That was then, but we’re living two thousand years later. What is the message of resurrection today? That’s the topic he takes up in chapter five. In this chapter, Williams speaks of five dimensions of the good news that the resurrection holds out for us today. First, the resurrection is a sign that "human beings matter." Human life has purpose. We have a destiny, which is to participate in the transformative work of God. Secondly, the resurrection speaks to the possibility that the world can (and has) change. The status quo isn’t final. Third, "death cannot defeat us." Speaking to a modern Christian world that often thinks in terms of a bland immortality, Williams declares that the resurrection is not bland immortality. It's not just survival after death. It’s a matter of confronting of the reality of death, knowing that God is greater than death. Fourth, the resurrection is a sign that Christ prays within us. In prayer, the Spirit makes Christ real in us. Finally, the resurrection is a sign that "God cares for all creation." That is, God will transfigure not erase or cancel out the material existence. This final piece is important, because I think a lot of Christians believe that this world is transitory and really of no concern to God. This leads to visions of dominion that ends up in exploitation. The resurrection, however, counters such ideas. Creation matters to God, even if it will be transformed, it matters. The book has an epilogue, that brings the two elements together. In this final portion of the book Williams points our attention to an icon at St. Andrew Holborn Church. It pictures the risen Christ reaching down to pull up a now mature Adam and Eve from death into life. This is the picture of a new creation, but it is a new creation that involves "humanity as it has become, our humanity, suffering and struggling, failed and failing. The resurrection is not about the wiping out of our history, pain or failure, it is about how pain and failure themselves—humanity marked by history—may yet be transfigured and made beautiful" (pp. 102-103). There is something powerful about that image. God is not wiping away what has transpired, but God does transform it. In this there is good news. This is a thoughtful book that is deeply orthodox even as it is challenging and provocative. Williams is a theologian of note. He writes for a broad audience, but it’s not “pop theology.” It’s deep theology that is translated into non-academic language. It’s accessible and well written, but it’s not easy. That’s because the topics are not easy to engage. But, they are central. So, this the kind of book that we need as we move through a new century as the body of Christ. It’s also a good book for groups to use during a season like Lent, when you’re preparing to go to the Cross and then the day of Resurrection.